The singing superstar made the announcement on Wednesday night via her Twitter and Instagram pages while wishing her man a happy fourth wedding anniversary. The 33-year-old, who is already mother to Egypt Daoud Dean, three, with the hip hop star, displayed her already burgeoning bump in an accompanying picture. 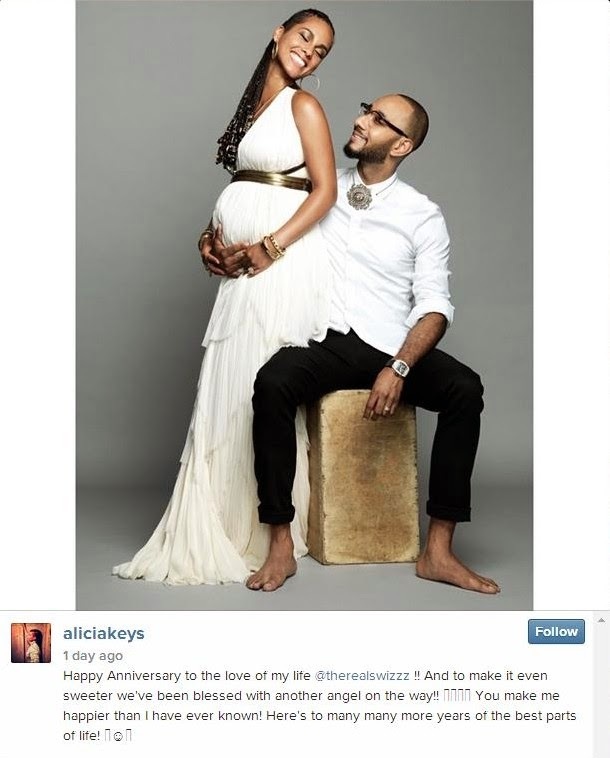 The R&B beauty told her fans: 'Happy Anniversary to the love of my life @therealswizzz! And to make it even sweeter we've been blessed with another angel on the way! The loved-up image sees Alicia clutching her rotund belly while dressed beautifully in a floaty white gown, and looking towards Swizz who is sat down next to her. Alicia's ensemble has a distinctly Grecian theme, complete with metallic detailing under the bust, while her long tresses are braided over one shoulder. Her Money In The Band companion, 35, keeps his arm protectively around while looking dapper in a white shirt and rolled-up black trousers. He also echoed her thoughts on his own social media pages. Writing: 'Love is life & life is love and we're so excited for another GIFT from up above.